Welcome to the eleventh and final step in our free professional learning series on class and student blogging! The aim of this step is to guide you through the process of setting up your student blogs. You may already have student blogs or this might be something that’s not on your agenda currently. Whatever the case, it’s still a useful exercise to explore the topic of student blogs. If your students already have blogs, you might get some new ideas, or be able to share your own experiences with us. If you won’t be having student blogs this year, maybe the information will be useful to store away for the future. Educators normally start of with a class blog where the teacher writes the posts, and the students respond by writing comments. This gives the teacher time to increase their skills while gradually introducing their students to blogging, and educating their students on what is required. However, as the age of students increases, educators are more likely to have them to write posts on their own student blog. 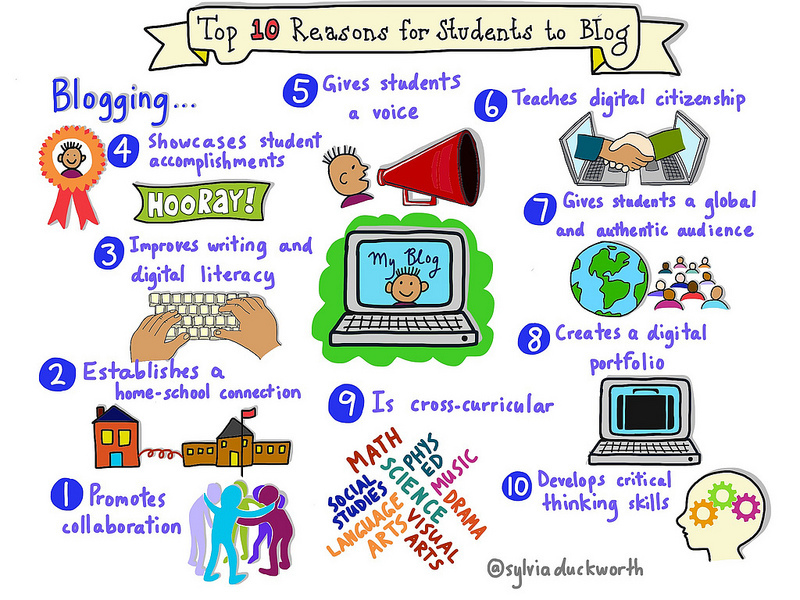 Student learning and writing improves faster when each student has their own blog as ownership is an important part of blogging. We all have increased motivation when we feel personal ownership. Students are more motivated by their own blogs when class blogging is done well. Another key benefit of student blogs is that they can be used as an ePortfolio or digital portfolio to create an archive of your students’ learning. If you haven’t already seen the following videos, we encourage you to take a look. the importance of writing as part of a global audience. To learn more about the benefits of student blogging in higher education, watch this video by students from the University of Western Australia. Check out Different Approaches To Using Student Blogs And Digital Portfolios on The Edublogger for more background information on student blogs. This post uses a continuum to demonstrate the different ways that student blogs are used. Looking at other blogs is a great way to get ideas and inspiration. This is something you could do as the teacher, but it can also be beneficial for students to explore other student blogs. If you come across any specific examples of student blogs that you think are worth sharing, please let us know. Leave a comment with the URL so we can add to our list and provide inspiration to others. You can use any blogging platform you like including Edublogs, WordPress, and Blogger, however, when we write detailed instructions they will refer to Edublogs. You can adapt this information to the blogging platform you are using. Unsure about what blogging platform to use? Edublogs is based on WordPress software that’s designed for education which makes it an excellent choice. Want to connect student accounts with your school’s username and password? Check out CampusPress — Edublogs premium solution for schools, districts, and universities. Learn more about CampusPress here. We’ll now go through three important things to consider before creating your student blogs. Educators normally use the same name for both the student’s username and blog URL. Keep them simple and easy for the student to remember. Most educators use a combination of their student’s first name followed by numbers that might represent the year, class number, and/or school initials. Ensure their username is unique (as Edublogs has close to 1,000,000 users). If you want the students to use the blog for their entire school life, you might consider using a combination of letters combined with a number that represents the year they started school or are finishing school. Your student’s username is what they use to sign into a blog dashboard and is displayed on posts and comments they write. The blog title is one of the first things a reader sees when visiting a blog. Unlike the URL, the title can be changed easily. We recommend you keep the student’s first name as the first part of the blog title if you’re using My Class. This makes it easier to identify a student blog from the Class Blog widget. The Class blog widget is used to list all student blogs attached to My Class. 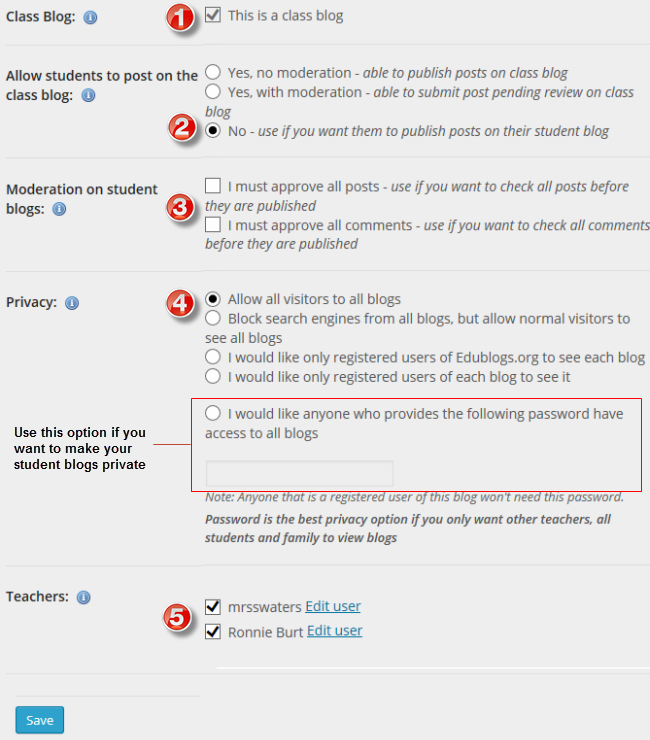 Remember, you can always change the blog title any time via Settings > General in the student blog dashboard. Always add yourself as an administrator to your student blog. This means if you need to edit/delete a post, page, or comment you can quickly access their blog from your blog dashboard. We’ll show you how to do this using My Class tool below. Educators either prefer to let their students moderate their own comments or they moderate all the comments for their students. There are pros and cons to each approach. Sometimes, educators moderate to begin with but then hand over responsibility when their students demonstrate that they’re ready. We’ll show you how to moderate comments using My Class tool below. Now you’ve done all the research, it’s time to create your student blogs! The easiest way to set up and manage all student blogs is using My Class. Quickly create student blogs with or without a student email address. Allow students to publish their own posts on their student blogs and/or the class blog. Control comment moderation settings on student blogs. Either the teacher or student can be in charge of comment moderation. Control the privacy settings on all student blogs with just one click! Blogs can be public, private, or somewhere in between (e.g. search engines can be blocked or only logged in users can visit blogs). Quickly view and/or moderate posts* and comments in one location in the Reader. *Note: My Class is available with free blogs; however, Edublogs Pro allows for teacher moderated posts and using embed code. Want to read more about My Class or download some cheat sheets for you and your students? Check out this post on The Edublogger. We’ll walk you through the first option. The following instructions explain how you create the student blogs yourself using My Class. Refer to the create own student blog support page if you want students to create their own blogs and attach their blog to My Class. 2. Add their username, email address (optional), password, blog URL, and blog title. If you leave the email address blank their user account is created using our no email option and you will be able to reset their password using the Edit link under their username in Users > All Users. All passwords are stored encrypted in our system and can’t be viewed by anyone, including the user. Record your students’ passwords in a spreadsheet as you create their account if you use our no email option. This creates their student blogs, adds them as a user to the class blog, adds you as a user to their student blog, and connects their student blog with the class blog. We recommend you use the preset password option and record their username/password/blog URL in a spreadsheet as you create their blogs. Some teachers require students to inform them when passwords are changed so they have a record of the student’s latest password. This is handy for those students who forget passwords or provided the wrong email address. Once you have created all your student blogs they will be listed in My Class > Student blogs where you’ll be able to view all pending posts, pages, and comments. 2. Drag the class blog widget to the desired sidebar. 4. Choose the options that suit you and then click Save. You can only use ‘Blog Name Only’ if you have more than 10 student blogs. Any time you add any more student blogs to My Class, you update the Class blog list by opening up the Class blog widget and clicking Save. 5. The widget will look something like below in the sidebar of your class blog and the sidebar of a student blog. 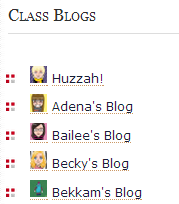 When you set up My Class, your student users are added as users to the class blog and to their own student blog. The menu items the students see depends on which dashboard they are logged into and what settings you have set in My Class > Settings. 1. Go to My Sites drop-down menu in your admin bar. The Reader is the fastest way to check all pending posts and comments on your student blogs. This allows you to preview posts and comments and publish them with one click! The Reader is also where you and your students can read and comment on each others’ posts. A number next to the Reader indicates there is a post or comment pending review. On the pending page, posts and comments are listed in reverse chronological order based on the date they were submitted. If you selected ‘I must approve all posts’ students aren’t able to edit the post once it is published. If you want the students to do further edits, you need to leave the post as pending or change the post to draft mode by opening it in edit mode. View Original — when you click on ‘View original’ it loads the draft post on the student blog where you can see what the post will look like when published. Edit — clicking on Edit opens the post inside the dashboard of the student blog where you can make edits to the post. Publish — to publish the post, click on Publish. Please note if you selected ‘I must approve all posts’, students aren’t able to edit the post once it is published. If you want the students to do further edits you need to leave the post as pending or change the post to draft mode by opening it in edit mode. The forward and back arrows allow you to navigate to the next or previous student post or comment. You can send a private comment to the student by selecting Private comment, adding the message and then click Post Comment. My Class > Student blogs and Dashboard > My Sites is where you’ll see all your student blogs listed. Here is where you can use the Dashboard link to access a student’s blog. You’ll also see the number of published and pending posts/pages/comments on their blogs. 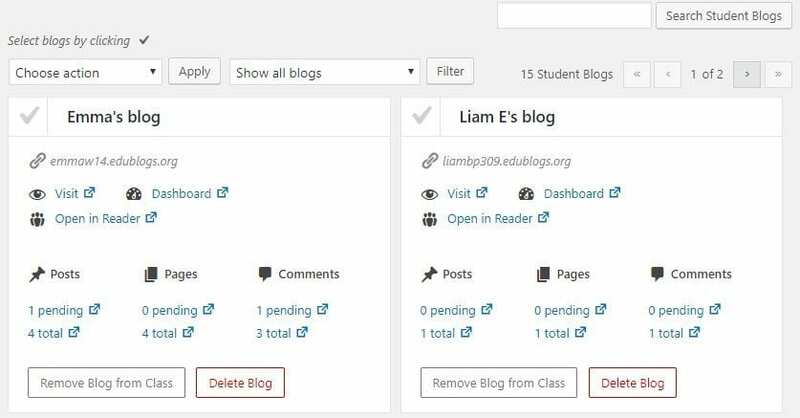 Clicking on pending under a student blog takes you to the pending post or pending comments page inside their student blog dashboard where you can edit, approve, or publish the post or comment. Reports, via Users > Reports, allows you to run a report on a specific student. It allows you to check comments they’ve submitted on any blog, or posts they have published for a specified date range. The Reader automatically feeds all published posts from all student blogs and the class blog into the dashboard of every user attached to My Class. This is where you and your students can easily read and comment on each others’ posts. 2. Click on Read More if you want to read the full post. Edit — clicking on Edit opens the post inside the dashboard of the student blog where you can make edits to the post (only visible to the teacher). Add New Comment — allows you to add a comment to the post from inside your dashboard. There is a range of different approaches teachers use to get their students started. Miss Wyatt’s Student As Bloggers links to posts on basic blogging for students. The Student Bloggers blog contains basic skills for students to follow to learn to blog. Have a look at Welcome to blogging, Today’s class assignment and Explore your blog on Blogging with Mrs. C for ideas on how you can introduce blogging to your students. The Student Blogging Challenge runs twice yearly starting in March and October. It is made up of a series of 10 weekly tasks all designed to improve blogging and commenting skills. Participating in the Student Blogging Challenge is a good way to develop your students’ blogging skills while connecting with a global audience. We have a Blogging Bootcamp course just for students. Set your students this course if you want them to learn about blogging at their own pace. Or you might pick and choose, and work through certain steps with your students. Do you have student blogs? If you do, your task is to leave a comment and tell us how they work. Do you have a good system in place or is there something you’d like to do differently? Hopefully, you have tips and examples to share with others. If you don’t have student blogs, leave a comment and share your thoughts on adding student blogs in the future. Is this something you’d like to investigate one day? Or are you happy just having a class blog or educator blog? Tell us the reasons why or why not. Note: If you’d rather complete the task as a blog post, feel free! Just pop the link in a comment for us to look at. As an added bonus, why not reach out to a student blogger and offer them some encouragement? There is a list of student blogs for the Student Blogging Challenge. Any of these young learners would love to hear from you. This is even something you could do with your class. Finally, We encourage you to read through the most recent comments in reply to this step and leave a response to another person’s comment. Have you completed each of the 11 steps in this course AND left a comment on each post? 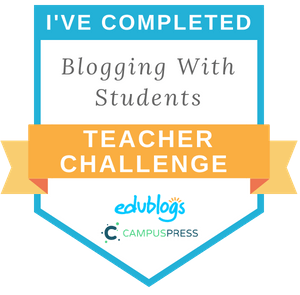 Maybe you’d like a certificate to show that you’ve completed the Blogging With Students Teacher Challenge course! If you’ve completed the challenge, feel free to proudly display this badge on the sidebar of your blog. Alternatively, you might like to add it to your About page to demonstrate your professional learning. I have started my students on blog sharing and at the time being it has worked out marvellously! If I had to restart the process all over again I would have the students play with the possibilities before asking them to publish, view, comment and start conversations. Overhead projectors will do the trick to have them follow your lead. 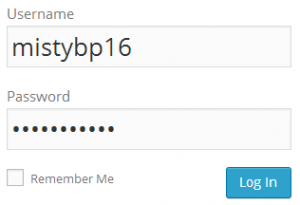 I am still having issues with password change when the student doesn’t add a mail to their blog creation. If you’re still having issues with passwords, feel free to email the support team (support@edublogs.org) and they’ll be able to help you out! I am not using students blogs yet. I’m starting a class blog this year and see how it goes. I want to try students blogs, but I have to develop a strategy to keep students motivates through out the year. Hopefully I’ll achieve it one day! Great plan! Perhaps quad blogging or team blogging will also help to keep students motivated. Having an authentic audience can be really powerful! My student blogs are all set up and students are beginning to put their creative-writing works on the pages and are commenting on each other’s posts. We have a class blog and all student blogs are attached to it as I find it more helpful than having to check each individual blog; I can do it via my dashboard and/or the Reader. That’s a great feature of Edublog! The only suggestion I would have is that you put this module at the beginning of the course, rather than at the end. I would have found it more useful when I was setting up the class and adding my student bloggers but it’s still full of good ideas. I believe this is the last thing I have to do in order to get my badge — so…. thank you and happy blogging everyone! I am new to blogging and will be setting up my student blogs tonight. My goal is to have students up and running during our block periods next week. They will join the student blogging challenge to begin with. The students are a mixed bag of excitement and curiosity at the moment as many still do not know what a blog is. Tonight we are starting out Blogging Club, we have officially set up the children’s blogs but it will be a couple of weeks before they begin to post. We will start by teaching them the basic skills of blogging and commenting. then moving on to posting their won posts. We are really excited to get going. As I teach Social Studies, I do not have student blogs at this time. I am required to have a teacher blog, as a means of communication with students and parents, and I began this course in order to learn things that would make my blog user-friendly and engaging. I do think that has happened! I can see the possibility of student blogs for submitting some work in the future, and certainly do not rule it out. I do think that if I were teaching ELA, I would use student blogs, and as that is one of my areas of certification, that could happen some day. At the moment, I think its enough for my pupils to have their postings placed onto the class blog by me (or my support for learning assistant). They need lots of encouragement and support to write what they do and often it has to be scribed for them by an adult. So, I don’t think at the moment they would be able to create postings unaided. However, I can think of many classes I have had in the past where student blogs would have been exactly the medium to bring out the creativity in my students had. Next session, or with another group of pupils, I would definitely go down this route. Although I have dabbled with student blogs before, I have learned so much more from this teacher blogging challenge than I ever imagined. And having you remind me every three days to attempt the next stage was exactly what I needed, and the pace was just right. I have already suggested this course to several of my colleagues and I am certain some of them will take it up. Thank you so very much for giving me this relaxed method of learning the intricacies of blogging. I don’t feel like an expert yet, but I have learned enough to be confident in developing my blog into the future. Thank you. I agree, I have learned so much, and while I would not have previously considered student blogs, I now see ways in which I could incorporate them. I never thought I would learn so much, or that I would see my students gain so much interest in my blog. I look forward to starting off next year with so much in place (and better understood by me), so that my students will WANT to go to the blog! I agree! I have learned so much from this course. I am excited for the possibilities for my students. My plan is to dabble in it this year, and then jump in full force at the beginning of next year. My class is earning student blogs a few at a time. We worked together to set them up and I do have one student who has worked within the blog to publish some stories. He is a wonderfully creative writer. Students know they must meet basic behavior and responsibility expectations and be contributors to the class blog to earn a blog of their own. I enjoy the challenge and am still navigating the settings to allow them to post without approval as they gain experience. Below is the link to one of my student’s blogs. Thanks for sharing Josh’s blog! I hope he’s enjoying the process of learning about blogging. I always loved the way blogging can really help certain students shine — sometimes you wouldn’t see their true talents in class but they’d come across on the blog! Good idea releasing responsibility gradually too! Since this is the first time that I am writing a blog and also the first time I am using it in my teaching, I don´t feel ready to star a students blog. But I want my students to participate actively in developing the blog so last week I ask for a volunteer to write a post and I just publish it. It is a very interesting post, a bit long, but I am sure this is going to encourage otrer student to write to. And this is one os the aims of my blog, to create material, share information and develope a blog all together. I plan to create a class so my students can create their own blogs and post their group’s progress on their 20% project. I would love for them to connect with other classes and students doing the 20% project. I am really excited to get started and have our students share their wonderful thoughts, ideas and projects! Our blog is going to function as a class blog this year, and once I have the hang of the whole process we will move to student blogs next year. I still have a little ways to go before my students are blogging since my administration suggested sending home an opt-out form for students – even though the blog will be private with a password to access it. Even so, I’m excited to start this process! This has been a great opportunity for me. I would have never been able to set up a blog in less than a month if I didn’t have this course. I will be forever grateful! I have set up my blog and my students in one class. I am piloting it in one course to start and then will expand into my other courses next year. I can’t wait to see what my students will create when presented with this opportunity. I agree with you completely. When I started a month ago I did´t know a thing about that. And all that I did it is been thank to this course. I have my class blog all set up! Thanks to this course, I’m excited to be teaching with a new activity that is rigorous and relevant to my students. My students are all entered into the system with a new blog for them to get creative, stretch their thinking, and have a fun time learning. They have been primed with activities, and knowledge about blogging resulting in students excited to come to English Class. That’s so great to hear! Well done on completing the course! Thank you so much for all of this amazing advice! I am not quiet there yet with student blogs but hope to be there very soon. I have a started with paper blogs in our classroom and invited other classes to comment an dnow moved on using Google sharing option with a small group to try out commenting. I am excited to get the class onto their own blogs but as you say it is a process and I don’t want to rush it. I have set up student blogs (portfolios) and appreciate the moderation tools that are in place. The only concern I have is that I think students could possibly include unapproved content in widgets. One of my students posted a questionable poll which I had to remove but I only knew about it because I am checking their page progress carefully. My co-teacher and I have been using student blogs for the past two years. It’s definitely a work in progress! Last year we blogged with students once a week, this year we are trying twice a week. However, with the mandate of our scheduled class time, we are finding that it doesn’t leave room for instruction so we need to make changes going into this half of the year. It always seems to look good on paper, but then when we see the moving parts and student abilities there is room for improvement. Here is the post I wrote for students and parents that describes how we use blogging, but we will be making some changes going forward. I will add that blogging has been the best way for me to teach writing in my grade 8 ELA classes. I’m completely sold on this practice and hope to continue learning and adding new ways of utilizing blogs for my students. I’ve even reached out to a few teen “pro” bloggers as a way to show students the possibilities. Thanks so much for sharing your approaches to blogging. I know your insights will really help others who are just getting started! I just love the way you’ve reached out to teen bloggers too. I bet the students loved that! I really look forward to following your approach during 2019. I used the class/student blogs with my one writing class for the fall semester. Next semester, I’m expanding to students in all of my classes. I’ve learned so many useful tools and features to use with my students. I can’t wait for them to share all of the great reading and writing that they will be doing. I want their blogs to be filled with media that they’ve created and posts and pages full of their favorite books and pieces of writing. This course has definitely made that possible. Blogging was my personal edtech challenge for this school year. My goal was to learn about blogging myself so that I could help my students create their own blogs second semester. I want them to have the opportunity to choose what they write about with the expectation that if they get to choose their topic they will write more, better, and with less complaining. I have really enjoyed using the class blog, and I found this course really helpful in putting together a blog that I’m pretty proud of! Well done, Heidi! You should be very proud of yourself. What a nice feeling to finish up the course before the busy holiday period. I hope your students will get a lot out of blogging! Hello, my teacher thinks this is a really useful site, and the whole thing of making the blog surrounds our topic of becoming good digital citizens. I wanted to say thanks for helping provide amazing information that has help me make a blog! That’s really great to hear, Gabriel. Thank you! I can see using Student Blogs some time in the future; however, I am just now learning how to blog and set up a class blog (and I’m fairly sure I’ve done a couple things incorrectly already! ), so I need to wait until I’m more comfortable with blogging myself and with teaching my students how to blog before I set up individual student blogs. Sounds like a good idea. Personally, I found it worthwhile to get the hang of blogging myself before setting up student blogs! Love this set up. The only issue I have come across is that we have merged several classes into one clas blog, so we have around 60 student blogs. I want to still make sure all posts are moderated and approved but due to the quantity of posts I can’t easily publish all the students posts quickly as there is an enforced time delay between posts to prevent spam? is there a way around this? Sorry to hear you’re having this issue. Comment throttling is applied to prevent spam but you shouldn’t be facing this issue with approving your student blog posts. Could you let us know your blog URL so we can check out how it’s set up? You can email your details to support@edublogs.org if you like and we’ll be able to sort it out for you. So are all students able to see everyone else’s blog posts at all times? My students write fashion blogs so they are required to do formatting and include photos and so on. Is there the capability of attaching a word, pdf, publisher file and have it be visible to the rest of the class? You can control the privacy settings however you like. So you can choose whether you want student blogs to be public, private, accessible only to logged in users, or password protected for example. You can certainly add images, and other sorts of files like PDF and Word documents. You can read more about that here. If you have more questions, feel free to contact us directly and we can help. My students are all setting up blogs and joining the class, but it appears that for the last few students who joined, their names / links to their blogs are not appearing on the Class Blog widget-just their avatars. I can still access their blogs via my dashboard, but not via the class blog list. Please help! Sorry to hear you’re having trouble with your class blog list. I’m sure we’ll be able to sort this out quickly. Could you email your blog URL to support@edublogs.org when you get time? How do I connect already created student blogs to my class blog? When I try to add them to my student blog list on my class blog, even though I say it is an existing user, I get the message that the blog already exists. I know that! Please help! Thank you! Thank you for using my “getting students started” post! (#3 in list) I am in the process of restarting my class blog, so the post is currently not published. It should be back up by next week. I teach 3 sections of the same class. I would like to create a “My Class” for each section so that my students from 1 period don’t have to sift through all the posts from the other periods. Is that possible? Good question and we are following this one up by email for you. I am in the same situation. Please help me understand how I can set it up so my three classes will have separation. 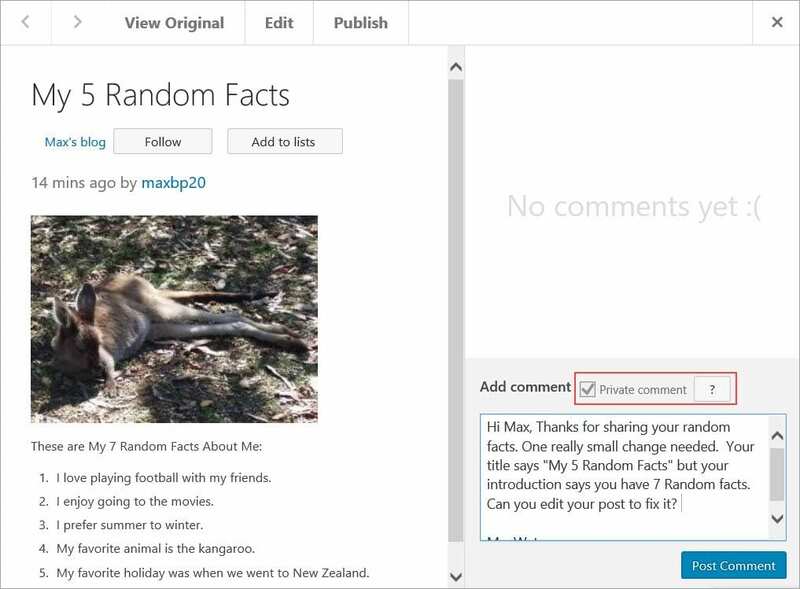 Do you want students from each class to be able to read and comment on posts from students of the other class? A well deserved step towards equality while judging a student. Thank you very much for including the link in your post! I teach high school full time and college classes part-time, so the information gleaned from the link is extremely beneficial. I’m just now learning how to blog myself, and I’m working on setting up a class blog, so I won’t set up student blogs until I’m more comfortable with the process. But I’m definitely bookmarking the link to your article!! Thank you for sharing that post! I agree that blogging at that level is just natural and necessary. It is a great assessment tool! Help! I set up my students blogs as their own account using a Google email however because they are not 13 they don’t actually have access to the email part. One of my students cannot login at all and I am thinking they changed their password even though they deny it but they have no idea what it could be. Anyway I can reset that password? I cannot figure it out. I can’t set them up a new one either since the email has been used. Thanks! We have worked with class and student blogs this year and so far everything works out nicely. Thanks for all the support, I think the teacher challenge was very helpful! Is there a way to get certain statistics about my students blogs? I have read about the google analytics and have looked through the widgets, but nothing seemed quite right. I’d like to see things such as which post got the most comments, who of my students is the most productive one, who has the most “clicks”, who frequently edits (changes dates above all), … the students blog overview isn’t very clear when it comes to certain stats. Please help! I tried to create blogs for each of my students. When I hit “Create blogs” after entering all the data for all the students, the site processed them, but only 8 appeared and all of the rest of the data were deleted. I started over for the rest of the students and added a handful more. That worked. Then I did it again for the next batch of students and all of the data vanished (again), and the pages were not created. BUT when I try to reenter the data for these students, I am told that their sites already exist. I am beyond frustrated and need help so I can get the kids started this coming week. Hi Ms. Almasi, adding a quick note here to say we’ve been helping with setting up your student blogs through Edublogs support. Also adding the Edublogs support email address here – support@edublogs.org so others can contact us directly if they need help. I created my student blogs this year with me adding all of them. It was so much easier than last year trying to explain to the students how to do it. It was more leg work on my part, but not too much trouble. Hi Mr Fritts, I personally think it is easy to create the student blogs using My Class > Create student blogs. Can be a bit more initial leg work but can make it easier. Thank you for this information. That is my plan to create the student blogs. I am glad to hear it was successful. I just created my student blogs. However, when I look on the dashboard of a student, I just see the class blog that I created. Please send an email to support@edublogs.org so our support team can help you. Both teachers use great strategies to introduce students to the blogging platform. I’ve already done a short “Getting Started” tutorial with my class to set up their user accounts. This took a lot of time. I would like to create a reference page like “Students as Bloggers” for them to refer to. I like how Mr. Miller has covered blogging vocabulary over a a few days. I would adapt the lesson topics of day 7, 8 and 9 as students are preparing to and media to their posts. Congratulations on completing the Teacher Challenge! I hope you don’t mind, I shortened your twitter feed and added the Class Blog widget to your sidebar for when you add Student Blogs. Just created the blogs for my students. I just created my student blogs. However, when I look on the dashboard of a student, I just see the class blog that I created. How do I change it so they see their own blog? If you mean the information in the Reader feed, this is different for each user. What you will see when logged in can be different from what your student sees when logged in. 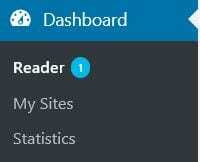 The Class Blog Reader area will show all the content from all the blogs from your Student Blogs network. Just a quick question…If I set up a class, with student blogs, is there anyway to cancel the class and still keep the individual student accounts? 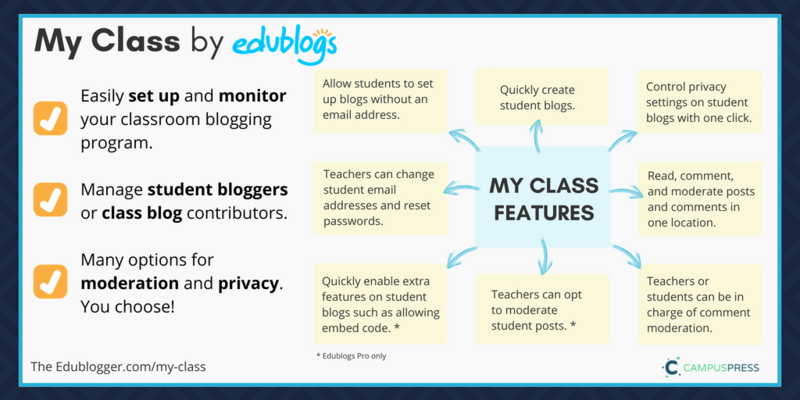 Your Student Blogs will still be active, but you will not have access to My Class features. Just checking this was the last step for the student blogging steps? Thank you for all the resources and assistance. I started my blog with edublogs with the name and my posts were displayed as dwilling. I changed to Blogger, where my posts I think were showing as Dearne. Apologies for the confusion but I decided to go with Blogger so students only had one login to remember – their Google account. Woo hoo do I receive a badge now 🙂 ? We have emailed you details on how to access your badge. Mrs Wyatt’s blog did not open. Mr Miller’s Blogging Bootcamp displays many great features and learning session ideas. 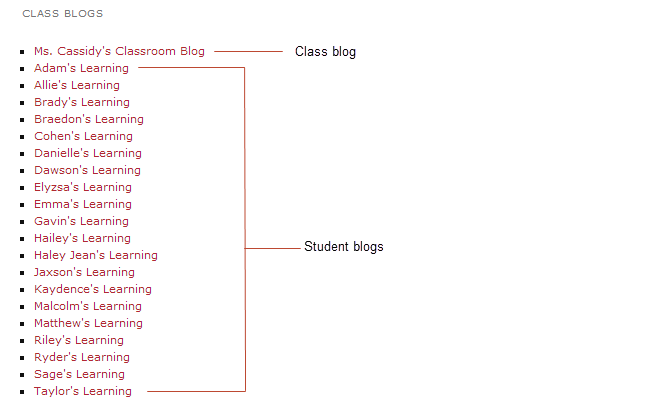 I like the lesson structures/plans to introduce blog elements. I have been doing Blogger each Friday as their learning journal. I have found blogging assists with literacy and word-processing skills. I like how the lesson planning allows for many features of a blog and how each student can build upon their own blog in coming years. Thank you for letting us know about Miss Wyatt’s blog. We checked the link, and it is working. I’m sure your students loved your approach. Congratulations on finishing the teacher Challenge! Oh my goodness, I’ve done it! took me all weekend but finally made it. Promised my students we’d all me blogging on Monday so had to figure it out. Thanks to the mighty Edublog team for all your support!!! Great work. how did the blogging go? There have been so many features of blogging I had not thought about this PD has included. I am even more excited about continuing the blogging theme during next term now I have had experience this term. I am asking this in the wrong place and I feel it is a dumb question but the answer is eluding me. I simply want to share posts from other blogs with my class. I can’t get my head around this task which I feel should be straightforward. 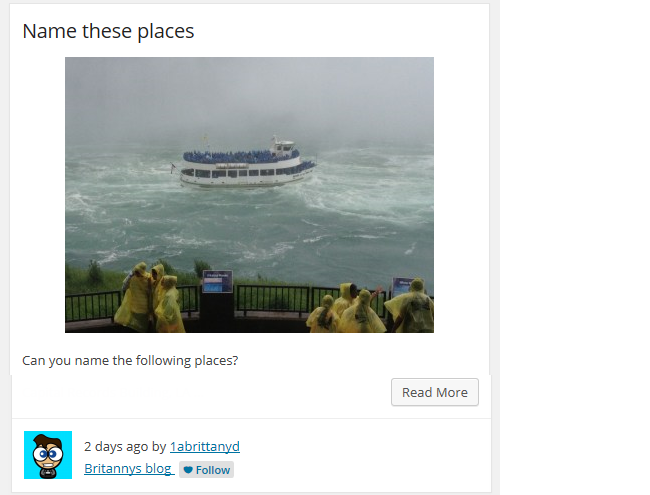 I really like how Miss Wyatt and Mr. Miller have set up student blogging like a student quest. There is a clear weekly structure and vision with challenges and obstacles that the students must address to progress through the course. I like the way Mr. Miller calls it “blogging bootcamp” – a catchy title with a reward of greater student freedom at the end of the rainbow. These types of challenges and rewards have a high appeal to the age of students I work with (grade 4). As this school year progresses and in future years of blogging with students, I hope to have more forward planning in place ahead of time and be confident and comfortable enough to release more control to the students so they are more empowered to chart the course of their own learning. Thank you again for all the fantastic resources provided here! I think Mr Miller’s Blogging Bootcamp is better for younger students so it would be a more appropriate approach for my own students. Since the whole process seems quite time-consuming collaboration between teachers would be another strategy. Students could learn the basics at computer classes and then practise in my English classes. Is it possible to involve different subjects/different teachers in a class blog? I really like the detail of Mr Miller’s bootcamp and will certainly use it next year. This year I had my students (11 and 12 year olds) set up their own blogs, including the name of it and their password. Over the course of the year some of the students have forgotten their passwords but have then had to use the ‘reset password’ link to fix it up. I found this a valuable learning exercise for them as 1) they stop relying upon me to be the password guru and 2) it will help then with other sites they many use in the future. I only had one student out of 47 whose parents did want them to have a blog so he complete the blogs using Powerpoint. I was wondering if I set up one that was completely anonymous it may prevent his parents concerns? Perhaps I need to point out the benefits and safety in a better way? I also discovered that even though my students have admin privileges for their own blogs they don’t constantly change components, so i would probably keep this for next year as well. Before I choose which way to allow students to create their blogs, I have a question or two that I am confused about. I think the best way to sign students up would be to create the blogs for them, but with over 150 students, I think that way may not be the best option for me. I think I will let them create their own blog and tie it to mine. That is where my questions lie. If they tie their blog to my class, will I still be able to monitor their blog’s posts and comments? Do I have administrative power over their account? I want to be totally sure about this before I go full in. Any help would be great. If the parents aren’t comfortable with their child’s first name being included as part of the username and blog URL then the best option is to set up their accounts using a pseudonym for their username and blog URL. Provided the student blogs are connected to the class blog via My Class you will have access to all their student blogs to monitor posts and comments. You will also be able to decide if you want to moderate all posts and comments using My Class. There are pros and cons with students creating the accounts themselves. It’s less work for you if they create their own blogs however if you decide to use this approach then it is important that you provide detailed instructions that guides them through the steps and provides instructions for their username, blog URL and blog title. Mr.Miller’s bootcamp has an excellent plan of action in introducing the class to blogging step by step. I might use it and licence the children at the end with the award of a badge and their very own blog. I agree with you. I think the use of badges to parallel landmark student learning can be a valuable tool that can move student learning towards desired outcomes. Best wishes for successful student blogging!